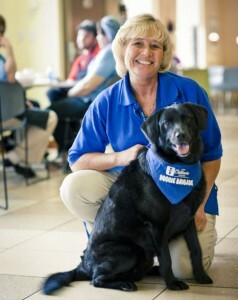 The Doggie Brigade is a wonderful expression of the family-centered care provided at Akron Children’s Hospital. One of the most powerful examples of this happened in the Radiology department at our Beeghly campus when Jack, a Lab mix, helped a patient through an otherwise difficult experience. Jack reminds me of Norm from the hilarious comedy Cheers. Norm would walk in and everyone would shout, “Norm!” That’s our Jack. He walks into a room and not only does everyone know his name, the entire room lights up. How Jack and his handler, Lisa Connell, came to Children’s is nothing short of inspiring. Lisa remembers when the Doggie Brigade came to visit her daughter in the hospital when she was 4 years old. It was a much needed distraction and the time was filled with smiles and laughter. During the years that followed, Lisa always wanted to find a way to give back to Children’s. When she was laid off from her job last year, the opportunity presented itself and she knew what she wanted to do – become a Doggie Brigade member. Now, she and Jack spend their days giving back some of the smiles and laughs they know can help patients and families get through their day. He may not be short — or stout — but Jack does a pretty good impression of a little teapot. As a member of the Doggie Brigade at the Akron Children’s Hospital Beeghly Campus in Boardman, Ohio, he performs on a regular basis for the children and families who turn to us for care.